The BSE Sensex closed 382.90 points, or 1.09%, down at 34,779.58 after shuttling between 35,605.43 and 34,727.16. The Nifty 50 ended 131.70 points, or 1.24%, lower at 10,453.05. 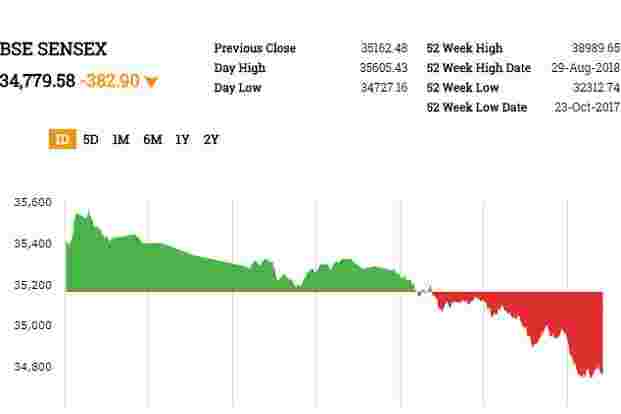 During the day, the 50-share index hit a high of 10,710.15 and a low of 10,436.45.The BSE MidCap and SmallCap indices slumped 2.23% and 2.21%, respectively. All the sectoral indices on BSE, barring FMCG and IT, posted losses with auto and realty falling most at over 3%. Oil and gas, industrials, consumer discretionary goods, basic materials and consumer durables fell over 2%. FMCG was up 0.11% and IT was flat.Coal India, Wipro, Infosys, Hindustan Unilever and ITC were among the major gainers on the key indices, whereas Indiabulls Housing Fiance, Yes Bank, Adani Ports, Maruti Suzuki and Tata Motors were the top losers. Mahindra and Mahindra Ltd said that it has signed two agreements with Ford in connection with powertrain sharing and connected car solutions. Under the agreement on powertrain sharing, Mahindra will develop and supply a BS-VI-compliant low-displacement petrol engine to Ford India for use in its present and future vehicles. M&M shares traded 2.735 down at Rs 757.5. British Prime Minister Theresa May and business minister Greg Clark met Ratan Tata, patriarch of the Indian Tata family, a few weeks ago as its car brand Jaguar Land Rover warns about the effect of Brexit and diesel policy, Reuters reported, citing a government source. Tata Motors shares traded 1.35% down at Rs 183 per share. The BSE Sensex traded 67.38 points, or 0.19%, lower at 35,095.10, while the Nifty 50 fell 42.60 points, or 0.40%, to 10,542.15. The BSE MidCap and SmallCap indices fell 1.18%.Sixteen out of 19 sectoral indices on BSE traded lower with realty and auto losing most at over 2%. Oil and gas, consumer discretionary goods, basic materials and industrials fell over 1%. FMCG, IT and teck gained.Infosys, Wipro, Coal India and Hindustan Unilever were among the top gainers on key indices, whereas Yes Bank, Axis Bank, Maruti Suzuki and Indiabulls Housing Finance led losses. NIIT Technologies Ltd shares rose 1.74% to Rs 1,160 per share. The company reported a consolidated net profit of Rs 112 core in the quarter ended September 30 versus a profit of Rs 67.2 crore a year ago. Consolidated revenue from operations rose to Rs 907 crore in the September quarter, compared to Rs 737 crore in the same period last year. Shares of Havells India traded 3.34% down at Rs 588.80 per share ahead of its September-quarter results due later in the day. During the day, the stock hit a high of 622.90 and a low of Rs 587.30.ACC (up 0.96%), DCB Bank (up 0.06%) and Mindtree (down 2.6%) and Reliance Industries Ltd (0.29%) are among the companies that will be announcing their September quarter earnings today. Shares of Cochin Shipyard traded 0.69% down at Rs 397.30 per share. The company on Tuesday said its board has approved buyback of equity shares worth up to Rs 200 crore. Shares of Lakshmi Machine Works Ltd traded 4.43% up at Rs 6,078.15 per share after the company said its board will consider a proposal to buy back shares. The stock rose as much as 8.07% to Rs 6,289.95 per share. Edelweiss Securities maintained Infosys as its top pick supported by robust deal-win momentum, digital-focused strategy, undemanding valuation and a high dividend yield of 4.7%. “We believe that sector is turning around and Infosys will be a key beneficiary,” it added. The brokerage maintained “BUY/SO” with a revised TP of Rs 880.Morgan Stanley analysts say the company is starting to show similar vertical trends to those of Tata Consultancy Services. Strong deal win and net headcount addition point to a strong demand environment, it added.Citi believes 2018 will be marginally better than 2017 for Indian IT, and says it prefers Infosys over TCS given better visibility post Q2.Macquarie raises PT to Rs 775, retaining “outperform” rating, but says Infosys still remains a work in progress, and, hence, 20% valuation discount to TCS is warranted.Jefferies raises PT on US-listed stock to $11.40 from $11, by “buy” rating. EBIT margin of 23.7% was 80bps below estimate and investments are likely to accelerate in H2 vs H1 suggesting further margin pressure at least in the near-term, said Jefferies.Prabhudas Lilladher says, “We believe Infosys valuations are reasonable considering the improving growth trajectory. We see possibility of Infosys narrowing its discount wrt to TCS owing to improved growth and strong aggression on deal wins. Our TP is retained at Rs790/sh (18x Sep20E EPS).”Motilal Oswal Securities maintained “buy” with a TP of Rs 800. “Visibility on revenue growth lent by 2Q execution and deal wins makes a case for some convergence, though the respective executions on margins will continue to warrant a gap,” it added.33 of 45 brokerages rate the stock “buy” or higher, nine “hold” and three “sell” or lower; their median PT is Rs 763, according to Reuters. Hero MotoCorp shares opened lower, but soon surged as much as 3.21% to Rs 2992 per share. The company on Tuesday reported a 3.38% year-on-year decline in net profit to ₹976.28 crore during the September quarter (Q2) due to higher raw material costs and other expenses amid subdued demand in key markets of Kerala and West Bengal. Shares of Den Networks rose 2.29% to Rs 75.95 per share, while Hathway Cable and Datacom traded 2.47% down at Rs 29.60 per share. According to an Economic Times report, Reliance Industries Ltd (RIL) could buy more than a 25% stake in each of these two companies to boost its high-speed broadband network. Shares of Adani Enterprises rose as much as 2.40% to Rs 161.65 per share on BSE after the company said it has signed an agreement with French oil major Total SA to jointly develop multi-energy offerings to the Indian energy market. Total and Adani will create a Joint Venture with an objective to build a retail network of 1,500 service stations over the period of 10 years. Shares of Reliance Industries rose 1% to Rs 1,174.60 ahead of its September quarter earnings due later on Wednesday. According to a Bloomberg poll of seven brokers, RIL’s consolidated net sales is expected to come in at ₹1.41 trillion; net profit is estimated at ₹9,630.20 crore by 10 brokers. Infosys shares rose as much as 3.53% to Rs 721 after the company posted a surprise 3.2% dollar revenue growth in the September quarter (Q2) from the preceding three months, the fastest sequential growth by India’s second-largest information technology (IT) services company in more than a year. The rupee opened marginally higher against the US dollar amid continued recovery in global equities. At 9.10am, the rupee was trading at 73.47 a dollar, down 0.1% from its Monday’s close of 73.47. The currency opened at 73.34 a dollar. The 10-year gilt yield stood at 7.885% from its previous close of 7.873%. So far this year, the rupee has declined 13%, while foreign investors have sold $4.36 billion and $8.42 billion in the equity and debt markets, respectively.